Knowing that often many of you do not come from construction backgrounds, I am offering you these 10 pointers to make your life easier. Even if you are used to construction, constructing a building with a committee is an art form in itself so these pointers should help you as well. The following points are elaborated on in the downloadable PDF (link above this article) I hope you find it useful. It is our experience that if a group knows its priorities and communicates well with each other, the solutions will present themselves. Then it is just a matter of deciding which solution is the best solution. Often we have found that the solutions that arise make the project stronger. Given that there will be problems, it is best to have as many possible solutions so that the best one can be selected. There is a natural tendency, especially when budgets are tight, to get the best possible pricing for the organization no matter what, and there are situations where sub-contractors, general contractors, architects, etc. for whatever reason will be losing money on your project. However, the project suffers and often in unseen ways whenever there is a team member who is not profitable. Though sometimes this is unavoidable, it is best not to try to force situations that will cause a team member to lose money. It may save money in the short term, but it is our experience that it eventually costs the project more. You need to communicate back to the community what is going on so that the community will understand and support the effort. Most importantly this all needs to be done civilly, openly, and freely. You may not be familiar with the design and construction processes, but you are on the Building Committee for a reason. You represent facets of the organization, and if you have a question, you can be sure that others in the community will have the same question. This is the hardest part of the whole job. There are many different people involved in the various processes and each comes to the project with a different perspective and experience—even within a small community. Stopping to really understand what someone else is saying, especially if it is counter to our own hopes and goals, is incredibly difficult but critical. Working with community-driven, committee-oriented groups is more of an artform than a strict process. The process can drive otherwise great architects and contractors crazy. This in turn makes the decision process for the Building Committee difficult and can cause increased costs. Not everyone on the committee needs to be familiar with construction. In fact, it is more important that they represent the various facets of the community. However, it is good to have some members with construction experience just to add to the comfort level to what your professionals are telling you. 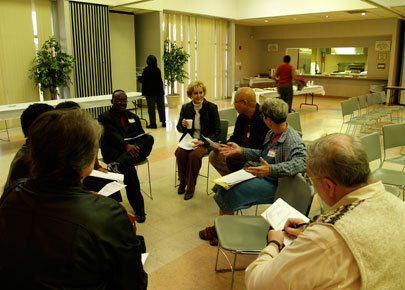 Interest/Focus groups (often formally established as subcommittees) are very important. They allow a small group of interested and knowledgeable people to focus on particular aspects of the project. This is information you need. The purpose of being on the Building Committee is to get something built, and thus, most likely, you will have a General Contractor. You will want to pick a General Contractor who has a great reputation, who has worked with many clients similar to you, and whose typical projects are on the same scale as yours. You do not want your project to be among the smallest (you may not get the attention you deserve) or the largest (they may not be ready for the scope) projects the contractor has. Each committee member, church leader, and clergy member comes to the design process with his or her own hopes and expectations.